To get a true taste of the souped-up, spirited world of Reverend Guitars, all you have to do is spy the office of Ken Haas, Reverend's general manager. Sitting atop one desk you'll see an extremely beat-up, burnt orange Avenger model that belonged to the late Ron Asheton of The Stooges -- and that went out on the road for Stooges reunion dates. Ken sporting a humbuckered Reverend guitar. And on another desk, Ken keeps the vintage clear flame maple Double Agent axe once owned by Reeves Gabrels (David Bowie, Tin Machine, The Cure). It's the kind of office clutter Ken keeps around for inspiration, because it reminds him of why he morphed from a fan of the brand into Reverend's top evangelist, if you will. Pete Anderson, Rick Vito, Gil Parris, Gabrels, and of course Kid Rock: All of them play Reverends, as does KH, who's in at least three bands at any given time. He took time out to usher us through the one-of-a-kind world of Reverend Guitars--and give readers a sneak peak at some new models on their way in 2014. Reverb: You guys are located in the Detroit area: Detroit Rock City! 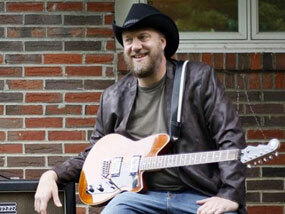 Do you find there's a certain Detroit attitude that infuses the way you make instruments? Ken Haas: We are so in Detroit. There's no doubt in my mind. The whole spirit of the area filters through everything we do. Joe Naylor, who founded the company in 1997, is from Detroit-Ann Arbor and went to school to study design at Western Michigan University. He opened a vintage buy-sell- trade-swap store, put his hands on tons of vintage instruments, and got to know all the players in the Detroit scene, including Kid Rock. He was one of Reverend's first endorsers, and has been really good to us for a really long time. Left to right: A Jetstream 390, Buckshot, Tricky Gomez, and Dub King Bass. Reverb: Tell us about the Kid Rock moment in 2000 that helped put Reverend on the map. KH: Kid Rock is holding a Reverend guitar on the cover of "The History of Rock," which I think sold a few copies. [Laughs.] We established an image with Kid Rock holding the guitar and flipping the bird. We took a little flack for that, but it was fun. And the whole point is that Detroit is cool. We get a steady flow of Detroit players coming through here and playing our stuff. Reverb: Reverend had a special relationship with Ron Asheton, who passed away in 2009. Why was he vital in your success story? KH: He was a huge supporter of Reverend guitars, and after he passed away, his sister gave us back one of his touring guitars, the one sitting on top of my desk. It keeps us grounded. 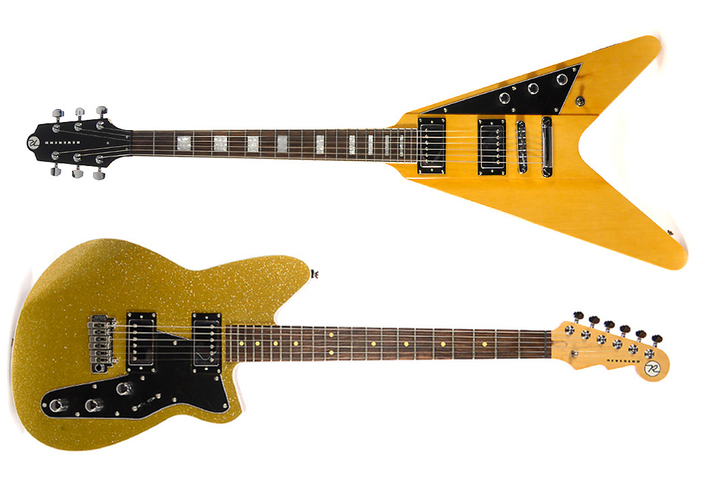 We make the Ron Asheton signature model still, and part of the proceeds go to the Ron Asheton Foundation, which benefits music education and the Humane Society in the Ann Arbor area. Reverb: You have some unique approaches to guitar making, starting with how you make an artist signature model. Walk us through that process. KH: We develop relationships with artists, then we sit down with them, and Joe Naylor designs a guitar for them from the ground up. We don't just slap someone's name on a model we make. When Reeves plays a guitar, it's not some crazy super custom thing we set up for him. It's the same guitar you can buy at any store. And that's how we can do a pro-level instrument for, in most cases, under $1,000. Our signature models are really built around the player and if you love that player, you can have a connection with them. Reverb: You make all of your guitars from korina. Why? KH: Korina has smoother tonal properties than mahogany, but it's consistently lightweight and it's very renewable. It comes from the limba tree in South America and Africa: You cut a field down, turn around and--pop!--it grows back. The natural finish guitars look cool, and look different. It gets funky little spots in it and has areas of deep grain that really jump out. We use a poly finish on the guitars but we keep it really thin. We could bury the guitar under half an inch of clear coat but that takes away from the overall tone and resonance. It really gets the job done. Reverb: Your guitars are made in Korea. 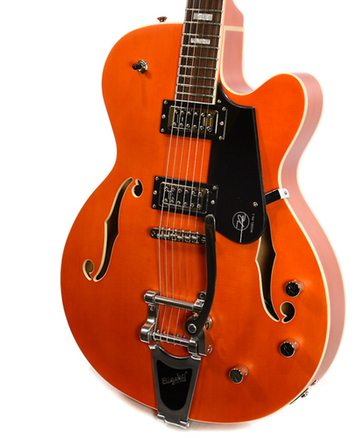 Some Korean-made guitars (like the Peerless-made Epiphone Casinos) have a great reputation. But it's not a given to find top-notch quality overseas. How did Reverend nail it? KH: Around 2005, 2006, Joe tried some original body designs, and we had a company we were working with in South Korea, Mirr Music. They sent us some prototypes, and we were just floored. We wound up going with them because they were able to turn our vision into reality. It’s worked out very well for us for the last eight years that we've been with them, We bring all the guitars to our shop in Livonia, Michigan and set them up. Any fretwork or finish flaws we work on, and when they ship to dealers, they are 100 percent gig ready. Reverb: Is there a testing process you put the guitars through before they're released? KH: These things get field tested and studio tested on a regular basis, and every time we have something out that's new, I get really excited. Lately I've been using one of our Pete Anderson Eastsider models. I've played it at every one of my Polka Floyd gigs for the last 18 months, and now it's really trashed. But I love it. It's my baby. Reverb: For the uninitiated, what's Polka Floyd? KH: I front and manage a band called the Polka Floyd Show and we play all over the country. We played the Anaheim NAMM convention in 2007. It is a Pink Floyd tribute band and we do "Dark Side of the Moon," but with an accordion. We're a cross between Dread Zeppelin and Weird Al. Reverb: Parting shot: What's coming soon in the Reverend line that players can get excited about? KH: We have a new Pete Anderson model, a PA-1 Custom HB, that will have a trapeze tail piece, humbuckers, and a flame maple back and sides. It also has an ebony fretboard and a bound headstock. Then there’s a new Reeves Gabrels signature model, the Spacehawk, coming at the beginning of 2014 that will be really cool. He currently plays lead guitar in the Cure. Come on: How many arena bands are left out there?